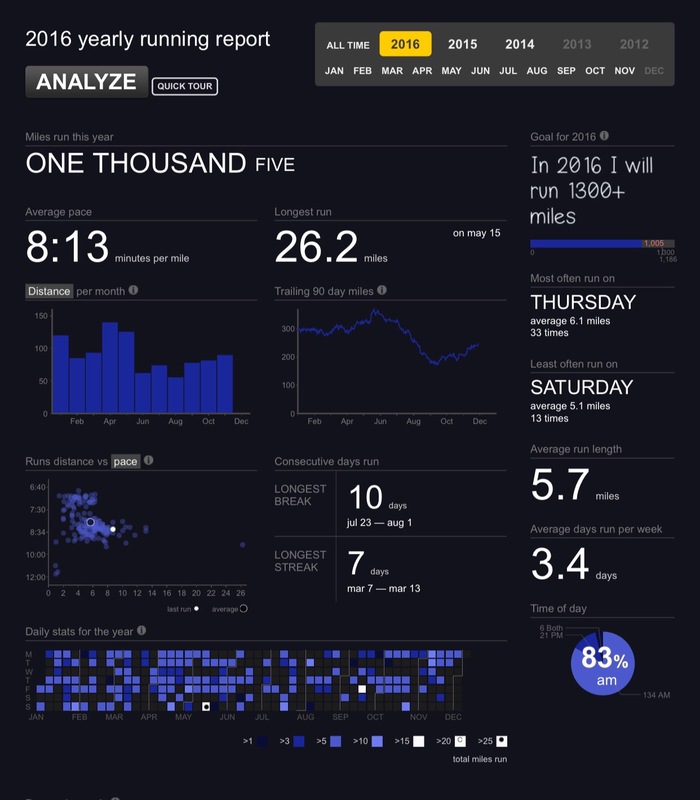 This morning, after finishing up an early run in Boston, I was scanning the data on my Smashrun account and realized that with the 8 Miles this morning, I had crossed 1000 for the year! Now, I am “happy” that I have been able to run 1000 miles in 2016 but I am “unhappy” that I am 186 miles behind my goal of 1300 for the year (I should be at 186 at this point if I am going to his 1300). So call this a “mixed feeling “so to speak on the accomplishment? Two things standout: first, I have more miles through this morning than I did for all of 2015. That is a positive. Also, my average pace in 2015 was 8:48/mile. This year so far, the pace is 8:13/mile. That is 35 seconds I have shaved off the running time which I am happy about. 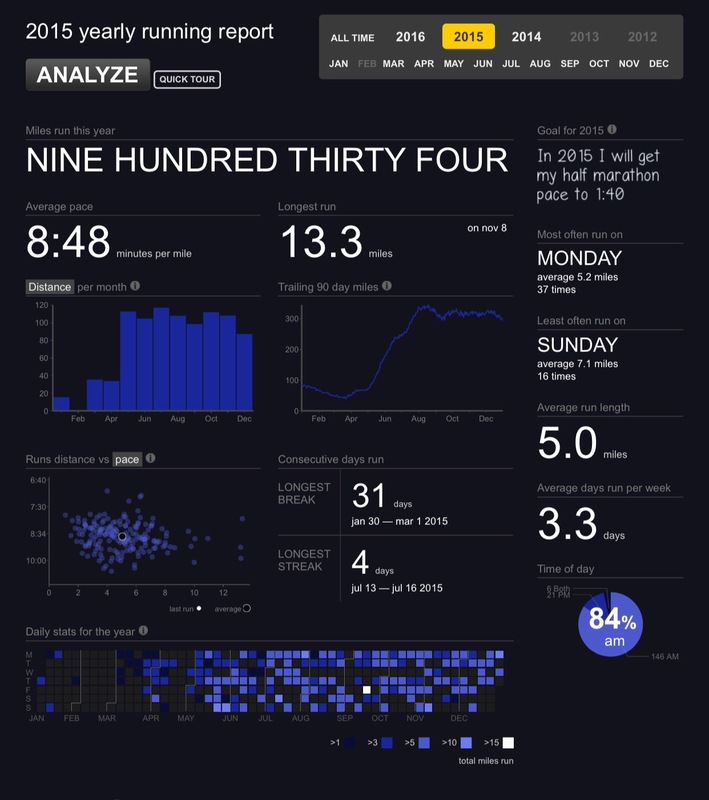 Now, here are my goal for 2016 that I stated somewhere earlier in the year (and cannot seem to find the post): 1300 miles and a sub 8:00/mile pace. As of right now, I have failed both and barring an average running distance of 9miles per day through the rest of the year, I am going to miss both goals. So should I feel down about besting my numbers significantly from 2015? After all, a drop in pace combined with more miles is a solid accomplishment. Well, it does not feel like a solid accomplishment and the reason is simple – it was hard getting to this point! Injuries just did not make it an enjoyable year. Yes, I saw many new things on my voyages, ran my first marathon and more races than in 2015 but the constant fight against nagging injuries just wore me down. So the key going forward is this: FOCUS ON THE POSITIVE! That is the long and short of it. Prior to last year I was a weak runner. Now I am a less weak runner! The key is to continue this into the new year and beyond. I still would like to run a 50k that comes right after the new year and with a strong December, I will be ready! Loving the first Harry Potter book (which I am listening to via audio book). It just takes you away from reality and the storyline, after a mere 8 chapters, is fantastic! Just in case you are looking for a discount on this CyberMonday, Aftershokz is having a sale today but it ends I think around 8pm. Look at my discount page for the latest Race offers across the United States. That’s about it. Have a great Monday (and week). Thank you for reading! Previous Post 5 for Friday: The Home Stretch!